In 1 1/2-quart saucepan, heat water to boiling. Stir in oats, gingerroot and salt. Reduce heat; simmer gently uncovered 25 to 30 minutes, without stirring, until oats are tender yet slightly chewy; stir in banana. Divide oatmeal evenly among 4 bowls. Top each serving with yogurt, mango, strawberries, coconut and walnuts. Serve immediately. To toast coconut, heat oven to 350° F. Spread coconut in shallow pan. Bake uncovered 5 to 7 minutes, stirring occasionally, until golden brown. To speed cooking time, substitute 1 1/2 cups quick-cooking oats for steel-cut oats, cooking as directed on oats package. 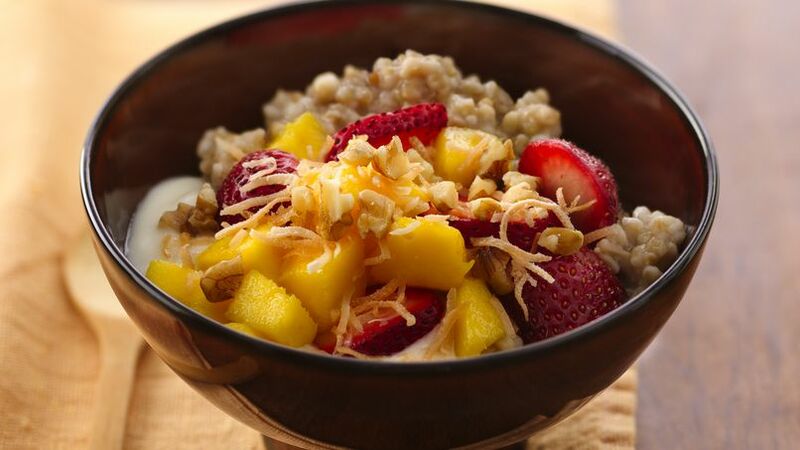 Delicious oatmeal combined with yogurt and fruits are perfect for a tropical breakfast.